Due to the changing structure of the markets with never before seen level of correlations due to HFT + EFT = GLEE, the individual metrics of corporations unfortunately mean less and less to the stock price (other than around earnings season). For someone who enjoys researching individual companies and trying to find the next generation jewels it's an exercise in frustration to have to spend 80% of your time estimating which way the market will move in the next 5-15 days (and hence almost every stock in your portfolio will move en masse). This has definitely changed my behavior and how I spend my time - far less time is spent reading up on companies, and much more time is spent on squiggly line analysis and sorting through tea leaves and seeing which ETFs HAL9000 is favoring this week versus last week. I can see this in the type of posts on the website as well - I used to spend much more time writing stories on the individual companies and their (archaic term alert) "fundamentals". So this morning I thought I'd go old school and actually post a nice summary on one of the companies - in fact, the one which was just re-introduced to the portfolio yesterday on the swan dive. Speaking of a company whose fundamentals were ignored as it got demolished when the market turned tail. As always, Investor Business Daily does an excellent job of a write up that is great for both first timers to a stock as well as those of us who have been following the name for years on end. There is no substitute for speed in the digital world. Everybody wants faster: faster computers, faster e-mails, faster communication, faster downloads and navigation. Riverbed Technology (RVBD) understands. The company provides technology that speeds up applications over wide-area networks, or WANs. Its products can help consolidate IT infrastructure, minimize bandwidth consumption and accelerate data access and backup. Speed is especially important for wide-area networks, which can go over oceans and continents. Riverbed says its gear can make applications run 10 to 100 times faster. That's no idle boast, analysts say. "If you look at the marketplace, their product is far and away the best product for WAN acceleration, period," said Alex Henderson, an analyst at Miller Tabak. "There is no other product that comes even close in terms of quality for what they do." WAN acceleration is a big part of a larger trend toward virtualization and cloud computing. Virtualization means each server can do the work of multiple servers. For data center managers, it's a much more efficient way to do things. Cloud computing means software is accessible over an Internet browser instead of only a local computer. Riverbed's technology, coupled with high demand for products that can enhance WAN performance, has kept Riverbed growing the past several quarters despite a cutback in information technology budgets for many companies. "The capital expenditure budgets of companies have not been rising, so they are spending in very narrow niches," Henderson said. "One of them is this orientation toward data center virtualization. The Street would define it as somewhat of a narrow niche, but it ain't such a bad niche to be in." The company's profit has grown for six quarters in a row. Sales growth has accelerated in each of the last four quarters. In a report, Citigroup analyst John Slack said Riverbed performed especially well in Europe despite the continent's debt and economic problems. He also noted an improvement in Riverbed's gross and operating margins. Gross margins rose 16 basis points from the first quarter to 77.3%. 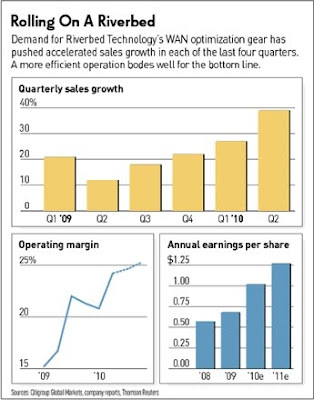 Operating margins soared 340 basis points sequentially to 24.2%. There is plenty of room to grow as more companies look to improve their WAN networks and virtualization capacities. "We're probably no more than 15% to 18% into that process," Henderson said. "The market is still in its infancy in many respects. I'd say there is a minimum three- to five-year cycle in front of us for very robust growth." Analysts expect an additional boost next year when Riverbed eyes a bigger part of the market for desktop virtualization. With desktop virtualization, companies manage desktops from remote locations for the entire organization. It lets them send updates and changes on individual desktops to a local virtualized desktop. Competition is a big risk, especially with new entrants like Silver Peak enjoying very strong adoption and good momentum," Bracelin said. Another risk is Riverbed's reliance on business with government clients, though the company has begun to lessen its exposure in that area. "There had been a lot of angst concerning their exposure to the government, especially if spending were to go down," Henderson said. "That's not as big a concern now. Government clients were around 30% of the business, but that's down to the low 20s."